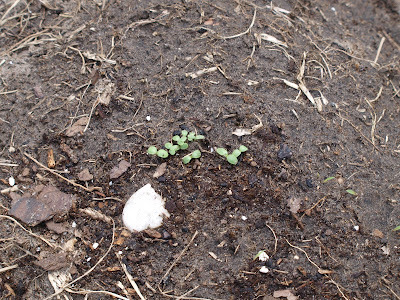 Shane Shirley : What's Growin' in the Garden? What's Growin' in the Garden? My girlfriend said our garden looks small...it's about 150 sq. ft. 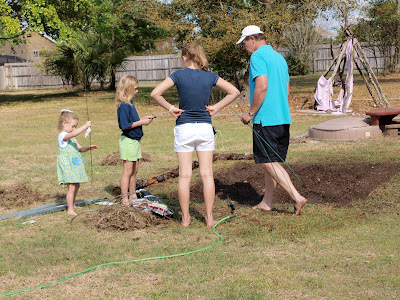 So my family is really excited about fulfilling our Earth Day 2009 commitment to move toward sustainability through planting a garden. How was I to know we would suddenly be cool? The First Family planted their organic kitchen garden (did you see the boots the First Lady wore...Oh My she caused a ruckus!!) over the weekend as part of President Obama's push for a Green Economic turnaround. Perhaps it had something to do with the 75,000 signatures collected on an online petition. Plus, if you haven't heard, Recession Gardens are totally "in" so we are cool. Wait, is it cool to say cool? Anyway, The National Gardening Association estimates that a well-maintained vegetable garden yields a $300 average return per year. A study by Burpee Seeds claims that $50 spent on gardening supplies can multiply into$1,250 worth of produce annually. Lettuce...no it's not weeds. We also planted carrots, melon, tomatoes, basil, squash, green beans and a huge pumpkin. For 2009, The National gardening Association is predicting a 19 percent increase in home gardening. I certainly am looking forward to a lower grocery bill. My kids love fresh, organic vegetables. Well two of my three kids love veggies and I am hoping that the third will get on board and eat the green beans she planted. Now all we have to do is find some info. on natural methods to keep the critters from eating the goods. She wanted to wear this 15 year old hand me down green sweater for St Patty's Day. I pick my battles. This time, she won. Marigolds, garlic, and onion are supposed to keep away critters. Spring onions will work and take little space. Garlic and onion work for several types of bugs, too. There's lots of stuff you can do and get that's natural and non-toxic. It seemed to work, the fenced garden never got touched by critters, and their own was eaten away all summer long. I've started an economy inspired garden as well. Beans, tomatos, lettuce, carrots, peppers, beets, basil, cucumbers, strawberries and squash so far. Unfortunately the ex got the house in the divorce, so my garden is going into planters that can move with me in a couple months. For now they are seedlings I started in eggshells. The beans have already graduated to small pots and the tomatos look like they'll move next. The kids love seeing the plants grow and helping to repot them. Sylvie, grandmothers always have sage advice. I will try some of your suggestions. I know my girls would love to have a garden for the critters. Upcycled Metals, where do you live? Sorry about the divorce. 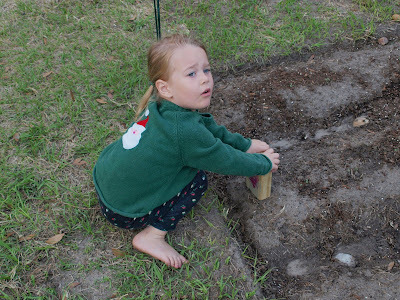 We were going to germinate our seeds but we took a chance on the Florida weather hollding out and planted directly in the ground. 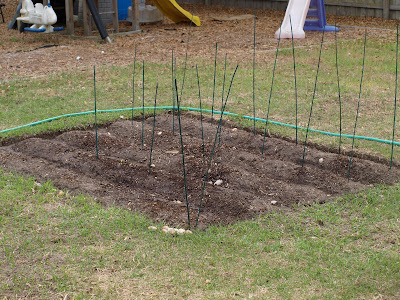 We planted green beans, tomatoes, lettuce, melon, a huge pumpkin, basil and carrots. I don't think I missed anything. Keep us posted on your traveling garden! Look into companion gardening. It is a pesticide free way of gardening. If you plant basil around your tomatoes, you wont get those nasty tomatoe horn worms. Marigolds are great and fragrant; plant them around your peppers. Cilantro is also a great herb to plant around your peppers. Companion gardening is the way to go. I haven't had any problems yet. Anonymous, thanks for the tip on companion gardening. I had never heard of it.